It’s waaaay past time I started talking & showing a bit more about my house. I’ve been (and will continue to be) stupidly busy working on the house for many weeks. These photos are ages old, probably from my first few weeks owning the house before I even moved in (back in April). When I bought the house, I owned the grand total of about 5 pieces of furniture: bed, dressing table, dining table, chair and bedside cabinet. I had a few other bits and pieces that were in the studio, either in use (oodles of freestanding shelves) or waiting for a new life (dining table which had been my sewing table of old). But really I didn’t have a whole lot of practical stuff. No sofa or armchairs for a start. Not good. So the first thing I bought was a china cabinet. And a Lloyd Loom chair to go with it (or, more likely, a fake). My grandad’s house has almost exactly the same two pieces, and many more. And indeed, I have since inherited some pieces from my great Aunt’s house including a second china cabinet (which I am going to collect this weekend!). 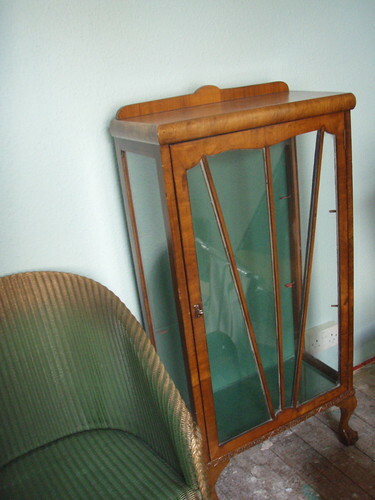 Good, proper, solid, pre-war granny furniture. I’m not sure I ever realised my grandparent’s house was such a design influence, but somehow it seems to be. Having said that, I grew up with tatty Victorian furniture and would love to have more one day. But for now, 30s basics are pretty cheap and they will do just fine. 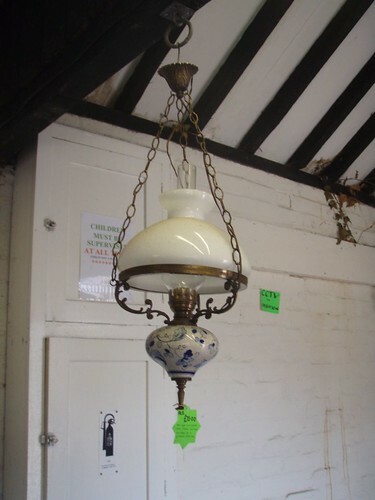 Around the time I moved, my mum found out about Lost World Salvage in Leicester – architectural salvage yard – which has since closed down. This is probably just as well as I could have quite easily bought a number of stained glass windows, chimney pots and slabs of marble for which I have NO use whatsoever. 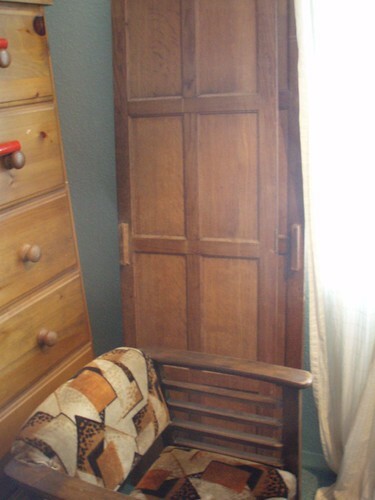 Likewise these oak cupboard doors. No use. Just love. They needed rescuing. £10 the pair. Oak. Doors. Lovely. You understand, yes? Well, I had hoped that they could be used for rebuilding my meter cupboard, but alas they are too wide. I have pondered making them into shutters for my bedroom, and indeed may do one day, but for now they are lurking in the bathroom (like a lot of things!) and they might even stay there. One day I will have cupboards made for the studio, so they could end up there. Who knows. In front is an amazing 1930s chair I got in a local junk shop for £5. FIVE POUNDS! for an un-restored 30s gem. I kind of find it ugly, but couldn’t leave it there. Junk rescue service for unloved granny stuff. That’s me. So I might re-cover it (preserving the old fabric) or I might ebay it, or I might just leave it as it is. At the moment it is buried under clothes in my bedroom. The ones that got away – things from Lost World Salvage I wanted to have but really couldn’t justify at a point when I didn’t own a cooker, fridge, sofa, front room floor, functioning boiler etc. Ho hum. One day a new (to me) lamp will come my way. 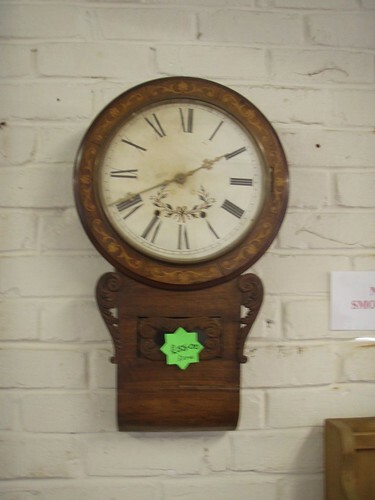 And maybe I’ll find a clock that works. 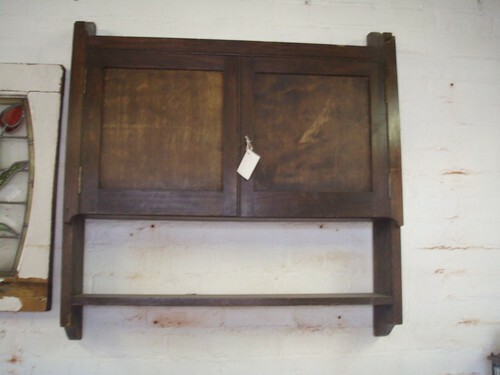 But I do wish I had splashed out on the oak cupboard, seeing as I am woefully undersupplied with storage. You see, storage is a problem, despite the vastness of this house, now that I have moved my studio in here too. Still surrounded by heaps of boxes! However, before long there will be more pics and details of the ongoing house work and I promise I will show you lots more of the pretty stuff I have been rescuing and filling my house with.